Re/insurers are anticipating moderate losses to result from the magnitude 7.0 earthquake that hit the city of Anchorage in Alaska on Friday morning. 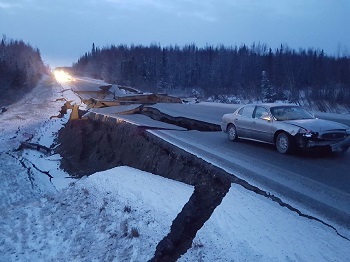 The earthquake, which struck around 12km north of Anchorage, has caused widespread disruption and damage to infrastructure, affecting thousands of structures and destroying many roads. However, there have been no deaths or injuries reported so far, and property damage is expected to be minor, as buildings in the region are built to withstand a certain level of seismic shock. The United States Geological Survey (USGS) said that it expects economic damages to exceed $100 million, with an 18% probability that losses could be more than $1 billion. The quake struck at a depth of about 44km on Friday and caused severe shaking that briefly prompted a tsunami alert for coastal areas. A series of aftershocks have since been registered, ten of which have been above magnitude 4.0 and three above magnitude 5.0, the Alaska Earthquake Center reported. The extent of the damage has been much less significant than originally expected, which will alleviate re/insurance industry concerns, although 10,000 Alaska residents currently remain without power and infrastructure such as roads and bridges seems to have taken the brunt of the damage. The earthquake is also expected to generate thousands of claims due to minor structural impacts to homes and businesses, but large-scale building collapses are not expected and earthquake coverage is not widely taken up around Anchorage, which will further limit industry losses. Analysts at Morgan Stanley noted that the top-10 homeowners insurers in Alaska are State Farm (32% market share), Allstate (20%), USAA (18%), Liberty Mutual (9%), Country Financial (8%), Western National (7%), Horace Mann (2%), Farmers (1%), Hartford (1%), and IAT (1%). Meanwhile, the largest commercial property insurers are Liberty Mutual (19%), State Farm (15%), Alaska National (11%), Allstate (9%), Allianz (7%), Chubb (5%), Tokio Marine (5%), AIG (4%), Country Financial (4%), and Church Mutual (3%). The firm also estimated that the earthquake insurance take-up rate in the affects areas is around 9-12% for homeowners and higher for businesses, with high deductibles of around 10-20% of policy limit. If building codes successfully limit the damage to properties in Anchorage, it is expected that primary insurers operating in the region will incur the majority of industry losses, while local and national governments will likely foot the bill for damage to roads and infrastructure.